ETHS Superintendent Eric Witherspoon met with a variety of city and school officials Thursday evening at the City/School Liaison Committee Meeting. Officials discussed increased safety regulations at ETHS and employment opportunities for Evanston youth, among other issues. 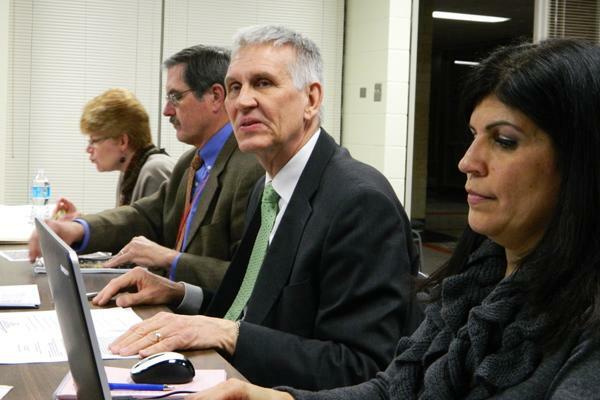 The collaboration between Evanston and local school officials continued Thursday evening with discussion of increased security at Evanston Township High School and additional job opportunities for high school students. About 20 people gathered for the quarterly City-School Liaison Committee meeting at ETHS, 1600 Dodge Ave. Several city officials and representatives from Evanston/Skokie District 65 and ETHS District 202 were present to discuss various intergovernmental projects and initiatives. District 202 school board member Gretchen Livingston, who is running for re-election, presented the latest ETHS graduation data, highlighting an 82 percent college attendance rate for the class of 2010. The high school’s dropout rate remained steady while the graduation rate increased in the past year, she said. Though officials praised the improvements, some remained concerned about the students not in the majority. Officials discussed the recent intergovernmental agreement between Evanston and D202, which called for stationing an additional police officer at ETHS. In exchange, the high school will also hire a new career and job counselor. The counselor will work primarily with students who don’t have a post-secondary plan in place, said Shelley Gates, ETHS’ career and technical education department chair. Gates also discussed the high school’s Career and Technical Education classes, which train students in prospective careers. One of the new classes that will begin next year is called “Construction and Geometry,” in which students will construct a house while learning about geometry. Witherspoon praised the success of the CTE classes and noted nearly half of all students had enrolled in at least one CTE class. Implementing greater security measures on the ETHS campus was one of the more important topics addressed Thursday. ETHS security director Sam Pettineo said many of these security plans had been in the works for a while, but the concentration of gun violence and homicides in neighborhoods near ETHS has helped the plans along. The high school will renovate the area in front of the main entrance of the school and in front of the gymnasium. These renovations will include increased lighting and emergency telephones and will be the result of collaboration between the city and the school district. Some of the construction will begin this summer, Pettineo said. Other potential renovations include the creation of two more bike highways for students to travel to ETHS. The committee meeting ended with a discussion of the parks, recreation and community services programs to increase summer employment opportunities for Evanston youth. The city department has created a steering committee that will aim to assist 250 Evanston teenagers in finding and applying for summer jobs through workshops to help students with interview skills and job fairs. Evanston city manager Wally Bobkiewicz described youth employment opportunities as “a major issue for Mayor Tisdahl and City Council” and expressed appreciation for the accomplishments of school-city relationships. “It seems like we’re on a road that’s a very strong one right now,” he said.